All that evil needs to win is that the good people do nothing, wrote Edmund Burke. One way of describing the work of vegan activists is to say that we try to stop people from turning away. Stop them turning away from the injustice, the pain, the suffering, the killing. Animals, if they could express their needs, would want us to look, to feel, to witness. To not turn away. We hate it when we see people turn away. We want them to look. To face stuff. To bear witness to what is happening. Sure, there are people who will be entirely indifferent to suffering. But I don’t believe that’s a majority, even though it may look like that. What helps me deal with our whole society turning away is one realization: that for many people, their reason to turn away is not that they don’t care. The opposite is true: many turn away because they care. Because they care, because they feel, because they empathize… they can’t keep watching. Our task is not to call these people hypocrytical. 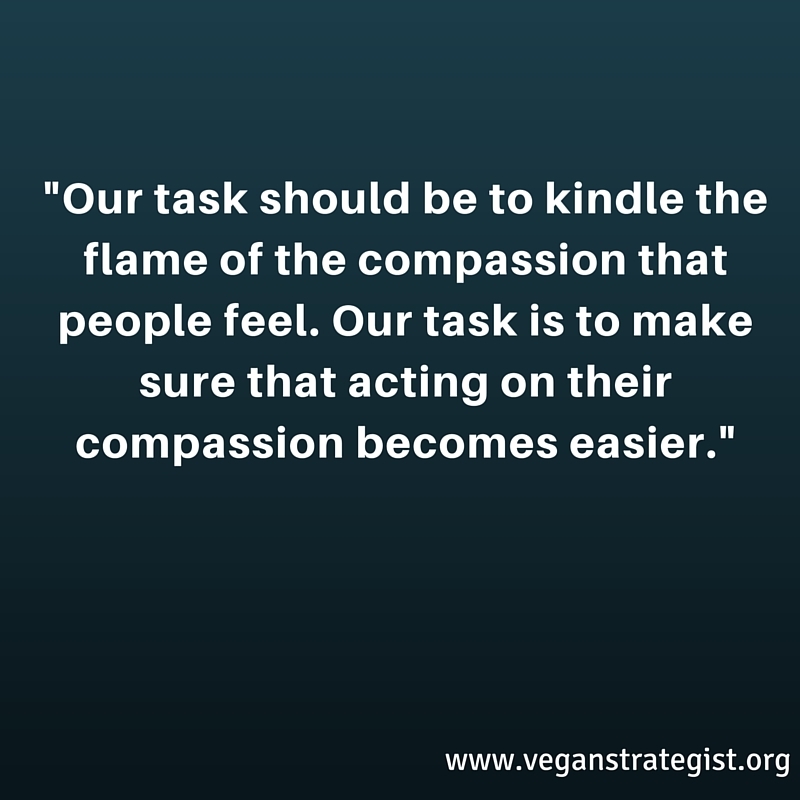 Our task should be to kindle the flame of the compassion that they feel. Our task is to make sure that acting on their compassion becomes easier. That there is nothing in the way of acting on their compassion. We, as individuals as well as as a movement, should be facilitators of compassionate behaviour. October 4 is the birthday of Saint Francis of Assisi, the Italian saint who according to legend could talk with animals. On that day, we celebrate World Animals Day. The situation of the animals in this world is kind of similar to the situation of the humans: some of them bathe in luxury – mostly the companion animals or “pets” in the rich countries – while many more live a life that’s nasty, brutish and short: the animals we eat. Pigs are at least as intelligent and capable of experiencing emotions as dogs, but as we want to buy their meat at as cheap a price as possible, the pigs of this world mostly lead short lives of fear, stress, pain and boredom. As a society, we do things with pigs, chickens and cows that we would never do to our companion animals. If you ask people’s opinions about eating animals, many or most of them will answer that we are allowed to do it, but that we must make sure they at least have “a good life”. Yet these very same people buy just any meat from the supermarket and when they eat out. That’s meat from intensive animal agriculture. You could call these consumers inconsistent or even hypocritical, but I’d like to call on a more human-friendly explanation: for most people, compassion towards the animals we eat is not easy. We are empathic beings – at least that’s my assumption. When another human being suffers, we feel it. We can also empathize with animals, sometimes even more easily or more intensely than with humans. Animal suffering is hard to watch – perhaps the perceived innocence of the animal has something to do with that, or its vulnerability – and there’s a reason why slaughterhouses are not public attractions. Any one of us knows that not only our companion animals but also those pigs, chickens and cows are vulnerable to pain and suffering. So why do we care about cats and dogs but not about those “farm animals”? The answer is simple: there is a conflict of interest. 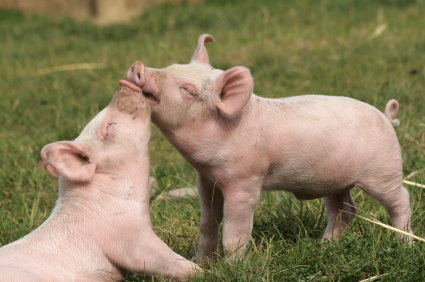 Allowing feelings of empathy towards a cow or a pig, requires of us that we re-evaluate our “use” of these animals, and – for many of us – probably a change in diet as a consequence. So many times I’ve heard omnivores say that they don’t want to watch an animal rights movie or read Jonathan Saffran Foers Eating Animals because they want to keep eating meat. Whomever feels the suffering of animals, does not want to eat them, or at the very least does not want them to be bred in factory farms. Becoming a vegetarian or drastically reducing one’s meat consumption seems the logical consequence. Yet for most people who love their steak or chicken leg, it just isn’t that easy. I know, because I used to be one of them. What we need to do is to make compassion easier. By giving people the experience that plant-based meals are at least as tasty as their favorite dishes with meat, we take away a number of barriers. Not only will people be more open to eat vegetarian, but more importantly: we take away a barrier to feel. 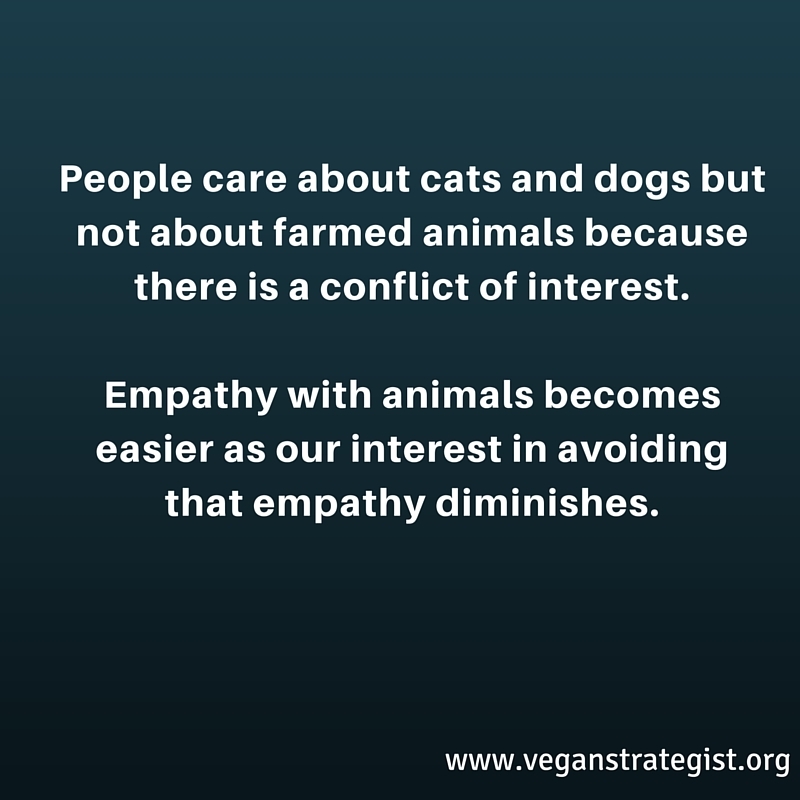 Empathy with animals becomes easier, because slowly but surely, our interest in avoiding that empathy diminishes. Those among us who wish to make the world a better place, hope that giving information to the consumer will be followed by a changed attitude and then changed behaviour. Sometimes that works, but there is in my mind not enough attention to the reverse: first make the recommended behaviour easier, so that it becomes easier to change one’s mind, or feelings. 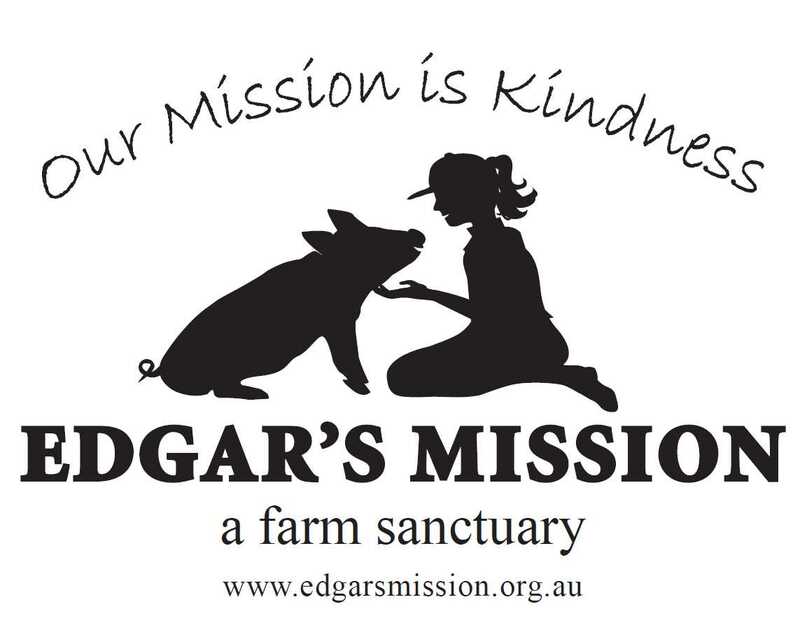 More and more vegetarian dishes in restaurants, more and better products in shops, more vegetarian options at all kinds of events, a larger offer of caterers, vegetarian cookbooks etc: all of these things can help assure that caring for non human animals becomes easier. It’s a pragmatic approach to bringing about a change of heart. After all, we’re not all Saint Francis of Assisi. Yet. We vegans (I should actually just speak for myself) undoubtedly get on your nerves at times. We bother you with our preaching, we are not always willing to eat the things that you serve us, we are quite difficult when visiting restaurants together, we slow down everything when we want to read labels, we may react socially inappropriate at times, and occasionally we even might make you feel guilty. So, I’m sorry about all that. But please know, dear omnivore, that being a vegan in a carnivorous world is not always easy, and allow me to give you a small glimpse inside the mind of at least one vegan. When I say a vegan life is not always simple, I’m not talking about the thousands of times we have to answer the same questions (what do you actually eat? Where do you get your protein?). Nor am I talking about having to read labels, or about restaurant staff that do not know what we eat or not eat. No, these kind of things I consider to be the pleasures of being a vegan, so to speak. I am talking about something completely different. It’s something I cannot easily express. It’s about a combination of helplessness and incomprehension. Helplessness in the face of so much animal suffering, and incomprehension and astonishment at the fact that it is not getting addressed and eradicated, or even perceived as such. 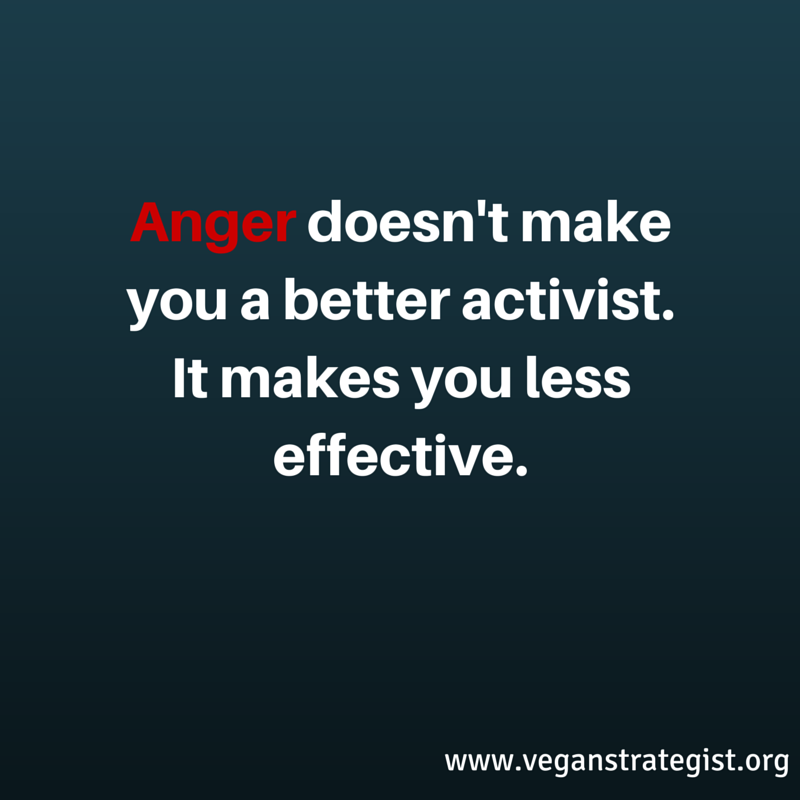 These frustrations, you may say, are not the privilege of vegans, and you may be right. But still, it is different in this area than others. For the problem of the endless suffering of animals by human hands, there is a solution which is actually quite feasible: it would just mean that all of us start eating only delicious vegan food instead of dead animals. When you consider this on a global scale, at the level of all humanity, this solution seems to be (at least in short term) not quite realistic. But at individual level, it surely is possible, in theory, for everyone to join. 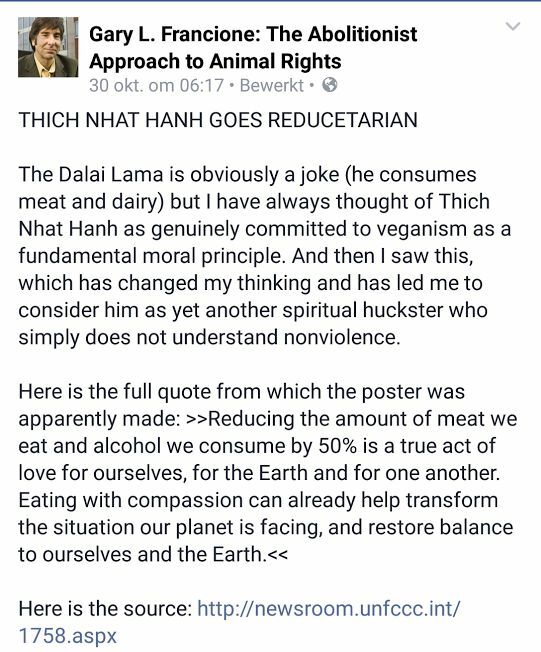 And then you (I mean me now, the vegan), start thinking and chewing your thoughts, over and over again. You realize that even if the solution is simple, ultimately it is not happening, and people do not participate, they continue to eat meat. And you wonder why. You wonder whether you may be seeing things that are not there. You ask yourself if you are hyper-sensitive or overly sentimental. You consider that you are maybe an alien, or just downright crazy. You tell yourself that it cannot be as bad as it looks, that there must be some justice behind it all. Karma perhaps. But that doesn’t convince you. And again you try to find out what it actually is that you dislike so much and whether it is actually so awful as you think. And you keep on coming back to the same conclusion: yes, what happens *is* horrible. Sixty billion animals every year that lead a miserably short life, because we humans find their meat tasty. That’s actually all that is going on. And you wonder why it does not stop and since it is not stopping you ask what you can or should do to make it stop. You try some things here and there, but it is never enough and you can see change but it is very slow. And above all: there seems to be no way to explain it to the people who don’t see it. You can not even show them any pictures or videos because they do not want to watch them. They tell you all the things you tell them are just exceptions and that in the end it is not all bad. And you’re considered to be adhering to a new religion, or you have simply made another choice than they did. And you try to explain that it is *not* just a matter of taste or preference. That eating meat or not eating meat is not a matter of painting the living room in yellow or in green. Because by now you are convinced that not eating animals is not only a compassionate but also a very rational thing to do. How can it be so difficult, you think, to see that we should avoid inflicting pain and suffering and killing where we can easily avoid it? But the others don’t understand, and so you try every possible way to explain. You appeal to moral philosophy, to arguments about the environment and health, you cook, you let people taste, and you hope that you have some effect, drop by drop. And you can see that in almost everyone’s case, all that is needed to understand and feel, is already there. You can see that most people love their cat or their dog, you see that they really cannot cope with animal cruelty. Similarly they are not convinced anymore that eating animals is required to be healthy. And yet all the time they tell you that what you are saying is not exactly right, or it is inconsistent, or not feasible, or naive, or not important compared to all the human suffering in the world. And through all this thinking and talking and discussing, you constantly need to be careful not to seem arrogant. The deadly sin here is to appear as one who thinks he is better than the rest, a moralist who tells other people what to do. You must pay attention that you do not condemn others for what they eat – something which is very difficult because the other very often already feels condemned by your mere presence as a vegan. And you must be careful that you do not look like someone who hates, because actually you do not hate (although at times you may become a bit more aggressive, intolerant or judgemental, like every human being). You just can not understand, even though you try so hard. And of course you must look healthy all the time and can never be sick, because that would be the fault of your diet. Fortunately, dear omnivore, it is not all doom and gloom in our heads, and there are a few things that make it a little easier. Unlike what you may think, we do enjoy life and the food we eat – many of us discovered the joys of cooking and eating only after having said goodbye to meat and fish. And we definitely can see changes around us, faster and faster. And in our neighborhood and all over the world there are people who feel the same and fight the same fight. If we are crazy, surely we are not alone. We strive together for Something Completely Different. Personally, what helps me the most is the realization, over and over again, that I myself was eating animals for a long time past the point that I realized I shouldn’t do it. In a way, I am grateful for that. And I am grateful for the fact that I can feel, no matter how inconvenient that may be at times, and that I am vulnerable. This, dear omnivore, is – very simplified – what is happening daily in my mind. Perhaps in being clear to each other about our feelings, we can find things that unite us and stop talking in terms of me versus you, and may learn to understand each other better. And to understand is to love, they say. PS: animal suffering is not the only argument for avoiding animal products. Please realize there are many differences among us. “If you aren’t angry, you aren’t paying attention.” Ever heard that saying? It implies that being angry is a necessary consequence of being a conscious citizen, who is well aware of the horrors happening in the world – in our case, to animals. In this article anger stands for anger that is actually expressed. We can’t be faulted for feelings as such, even though we can learn to control them. Sometimes it feels to me that in our (or probably any) movement, anger is somehow put on a pedestal. Anger is seen as a sign of one’s commitment to our cause. Anger is thought of as giving us energy and passion. Anger is believed to be a driving force that keeps us going on and on and on. I’m usually an almost naively optimistic and irritatingly positive individual. I have faith in the human race, I can see advantages in the most terrible things and I can muster at least some understanding for things that most people won’t even want to hear about. But now and then, I’m angry. About so much suffering, injustice, indifference and stupidity. I do understand how people in our movement can resort to less peaceful behavior. Because the horror of what happens – what we are doing, as a species – to non human animals is so incredibly big, that we feel there is no other option. So yes, I definitely can feel anger, at times. The problem is that I think this anger doesn’t help me much. On the contrary, I think it actually harms me and the cause I fight for. When I get angry, I tend to resort to judgments, accusations, and black and white or us-versus-them thinking. My thoughts become less rational, I’m more prone to exaggerate things. So when I’m angry, I become less convincing. What’s more, as a movement we’re just not numerous enough for our anger to make much sense. Even if all the people in our movement were outraged, there would never be enough rage to change things, right now. Being angry all the time, moreover, is not sustainable. Rather than motivating you, it will burn you out. The other option is to try to understand others. We have to understand them, in order to help them open their hearts and minds. It is, I think, our only sustainable option. Cliché as it may sound, we need patience, compassion, empathy… not just for the animals, but also for the people who are abusing animals. Indignation is worthwile. It is good to not accept certain things (a lot of things, in this world). But we don’t necessarily need to be angry. We can hate the sin but love the sinner, so to speak. What I’m suggesting is that on top of being able to stand all these atrocities, we now also try to be kind – or at least not be to hateful – to the perpetrators. I know that is a tall order. I have noticed that there is a part of me that finds being angry somehow devilishly attractive. Isn’t there some slightly fun aspect to fighting, to gossiping, to being against, to focus on a bad guy (or bad girl)? It is as if we (or some of us) need an enemy, need someone to be against. Maybe that’s why it’s difficult to try to see animal abusers not as enemies, but as people with their own problems. People who, maybe, we need to help and try to understand, rather than condemn and punish. It’s good, I think, to be aware of that. It’s also good to be aware of the fact that in every single one of us (except for the saints reading along) there is a lot of room for improvement. In many ways, we are all part of the same group. The group of people who can use improvement. This is about lifting the whole of humanity, including ourselves, up to another level of compassion. If we need to let off steam, now and then, we might do it in the privacy of a closed Facebook group, in the gym, or with like minded friends. But outwardly, it would be great if we could be a shining example of compassion, helping people, showing them the alternatives, reaching out our hand. We can say a thousand times that going vegan is not difficult, and that is a moral duty, but we’ll jump further if we show some understanding.One day, we will have opened enough people’s hearts and minds and we’ll be beyond the point of no return. What will bring that day closer, is not our anger, but our love. PS: let me assure you I don’t always manage to practise what I preach. Sometimes you teach well what you are most needing to learn, maybe. 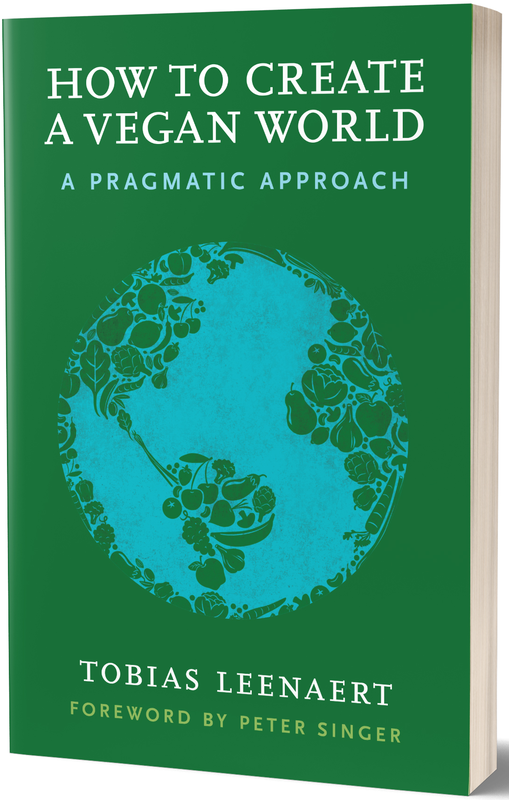 Much has been written about pope Francis’ encyclical Laudato Si‘, which is about our relationship to the earth and the animals. While I think the catholic church, like any religion, has a tremendous amount of work to do, Francis is in my view a pope as good as popes come, and the document he wrote, while definitely not a vegan or animal rights manifesto, is a good start for a more responsible and sustainable stewardship of the earth. I wanted to focus briefly on one sentence from the encyclical, which says: “It is contrary to human dignity to cause animals to suffer or die needlessly.” As a vegan, one would obviously say: well duh! When we kill animals for food, we do cause them to suffer and die needlessly, isn’t it? “But for the sake of some little mouthful of flesh” sums it up quite well indeed…. I think most human beings are capable of understanding this. However, I’m a big fan of taking the other person’s viewpoint, and when we do so, we understand that people who still enjoy eating meat or fish or dairy are not yet seeing things the way Plutarch does. They, like the pope, are apparently not seeing how animals are “suffering and dying needlessly”. They are stuck in traditional views of humans and animals, where the former are so incredibly superior to the latter, that this short gustatory pleasure apparently justifies taking other sentient beings’ lives. To make people see things differently, we can scream and shout and cry, we can use logical discourse and arguments, we can show them what happens to animals, we can try to lobby for laws and many other things… But the most important thing, in my view, is making it easier for people to think straight about animals and to compassion for them by making our society, and the individuals that form part of it, less dependent on animal products. 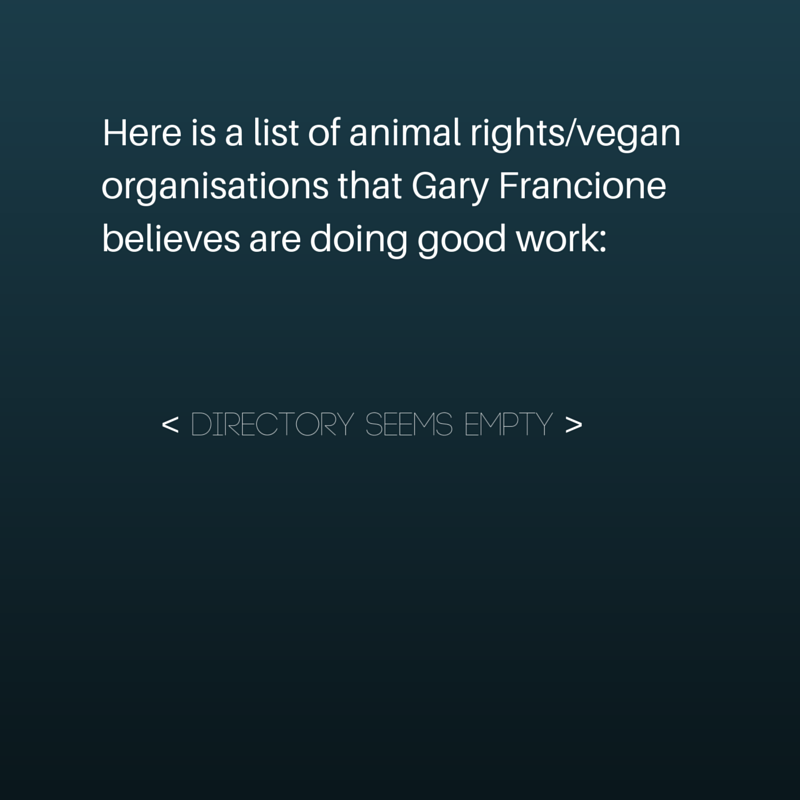 We can do this by supporting the spread and growth of vegan products in stores and restaurants. We can found or support new businesses that develop alternatives. When it’s about food, people think with their stomach. We can’t make people think the way we think, we can’t make them feel the way we feel. We can’t make them see animals like vegans see them, right away, right now. All we can hope to do is to open their hearts and minds. And I do believe we can do that. And that we will end up with compassionate people in the end. We just have to make it a little bit easier for them first, by taking away the barriers. How we experience the world, and whether it’s good or bad, whether people are good or bad, is often mainly a matter of focus. It’s a matter of what we want to look at, and how we interpret things. Yes, people are responsible for a huge amount of horrible stuff. Among those horrors is the way we raise and eat animals, sixty billion of them every year. So it’s easy to condemn Homo sapiens and consider us an utterly depraved species. But let’s try to see things in another light here, for a second. We’re an animal, just like other animals. The primitive parts of our brain are still there, and they’re active. They haven’t been selected out. Our biology is bound to make it difficult for us now and then, certainly when it’s combined with our tool-making intelligence. 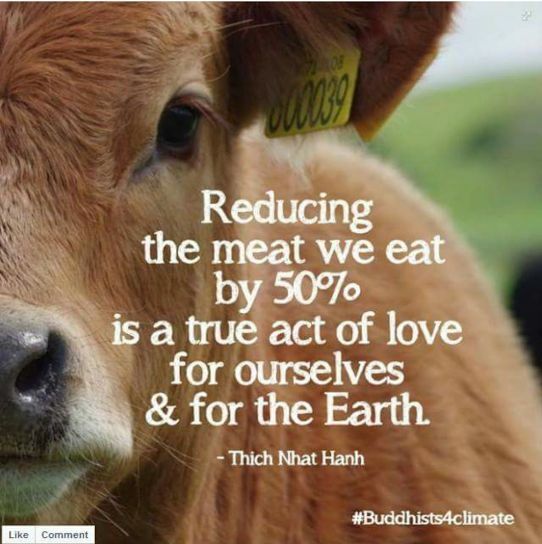 But in spite of this, for the first time in the history of our planet, an ever bigger number of people is consciously saying no to eating animals. For the first time ever, a species is actively defending another species. This is special. It moves me. And I get a warm feeling when I see people get together, speaking up for those who can’t. When they do it with patience, with love, with compassion for everyone who is not yet there, who is still learning about kinder solutions… then all the better.